I am presenting a series of three lectures on German Genealogy on the third Saturdays of March, April and May at 1:00 PM at the Friendswood, Texas Public Library. The first session is coming up on Saturday, March 21. The topic will be finding your German hometown in American records. In preparation for that lecture, I have been researching several of the German names in our family history. The Prasse Family of Cleveland, Ohio has captured my attention both for their accomplishments and for their bountiful records. The new life story screen at Ancestry.com tells us: Gustave Carl A. Prasse was born in January 1828 in Leipzig, Germany. He married Christianna Sisser in 1845. They had five children in 13 years. He died on July 22, 1912, in Cuyahoga County, Ohio, having lived a long life of 84 years, and was buried in Cleveland, Ohio. The genealogy communities of Cleveland, Cuyahoga County and the State of Ohio have done an excellent job of preserving and indexing their records. 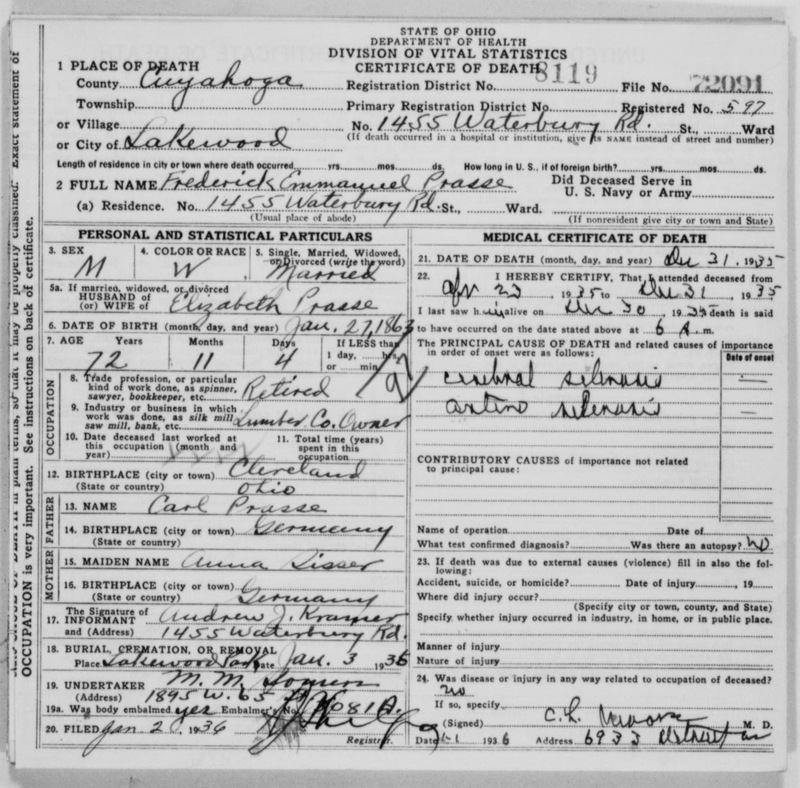 Ancestry.com has the Ohio death indexes and Family Search has images of actual death certificates. Starting with the most recent records about this family, I found death certificates, cemetery memorials, and interment registers which document their lives, deaths and burials in Cleveland and prior. The death certificate for “Carl G. Prasse” states that the original immigrant was actually born on the 12th of January 1826. The precision of this date makes me wonder whether there was a family bible. The informant was “C.G. Prasse” of Fairview, Ohio who is most likely his son, Charles Gustav Prasse. The residence in Fairview was Stop 3 of the Elyria Line. Carl died on the 22nd of July 1912 of “Old Age.” The only fact that Charles could offer about his father’s origins was that he was born in Germany. He apparently did not know or could not recall at the time, the names of his German grandparents. The death certificate did note that Carl G. Prasse was buried in the Monroe Street Cemetery. Have I ever told you that “Google is the Genealogist’s Best Friend”? Whenever you get a document like a death certificate you want to “Google” all of the names and places that you find. 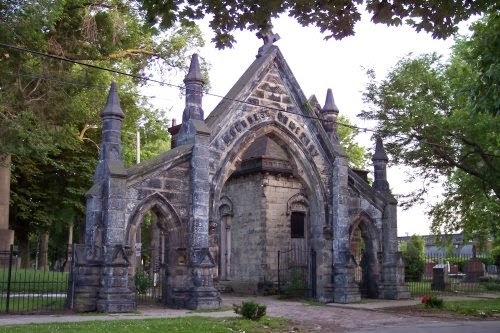 The Monroe Street Cemetery is a historic cemetery in Cleveland that has a wonderful website with pictures, history, a burial index and links to digitized interment registers. FindaGrave.com also has memorials for 21,796 interments but only 15% have been photographed. 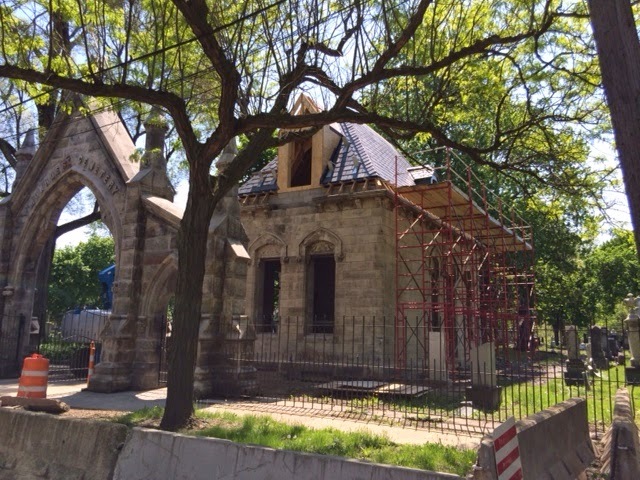 The Monroe Street Cemetery Index reveals that there were actually four members of the Prasse family buried here. 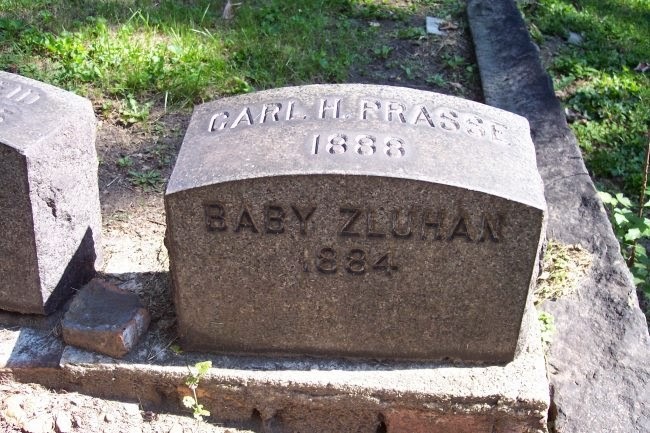 I double checked the address for the child Carl and it was entered as 242 Birch on the Interment Register. Since he was born in 1888 he was most likely a grandson of Carl G. and Christina. City directories might confirm which Prasse family lived across the street. These graves are located in Section C Line 8. Carl is Grave No. 14; Carl G. Grave No. 16; Christina E is Grave No. 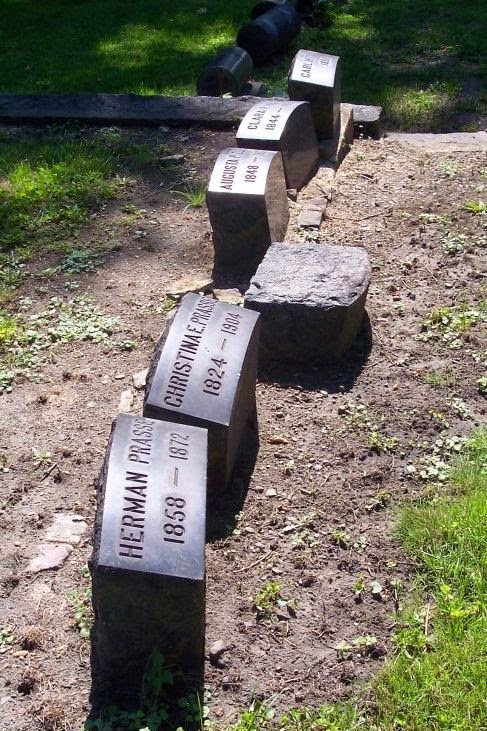 15; Herman is also in Grave No. 14. 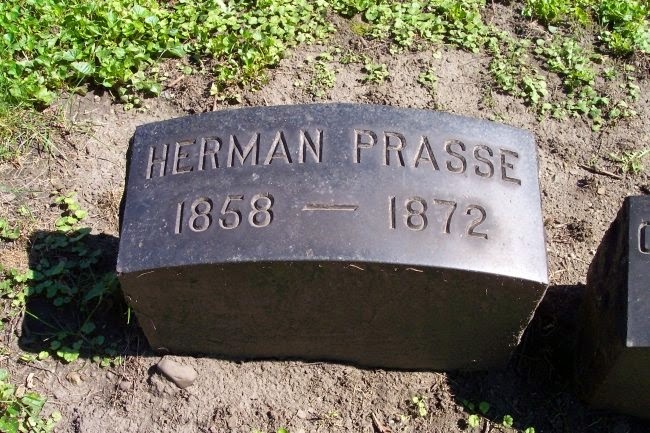 There was no picture of Carl G. Prasse's gravestone. It looks like it may have fallen over. 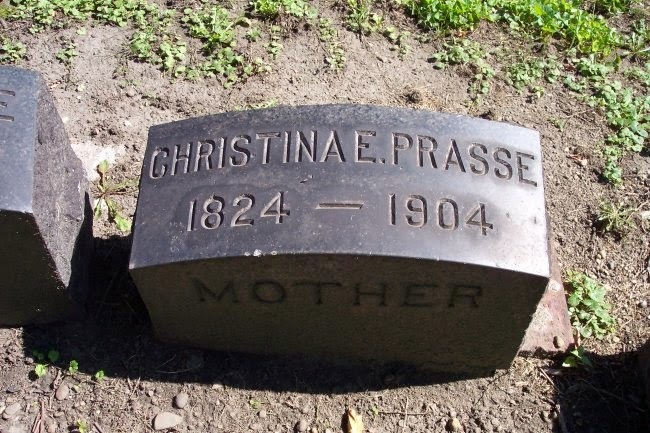 Unfortunately, Christina E. Prasse died in 1904 just before the Ohio Death Certificate Database on Family Search begins in 1908. My source for her maiden name was the death certificate of her son, Frederick Emmanuel Prasse who died in 1935. F.E. 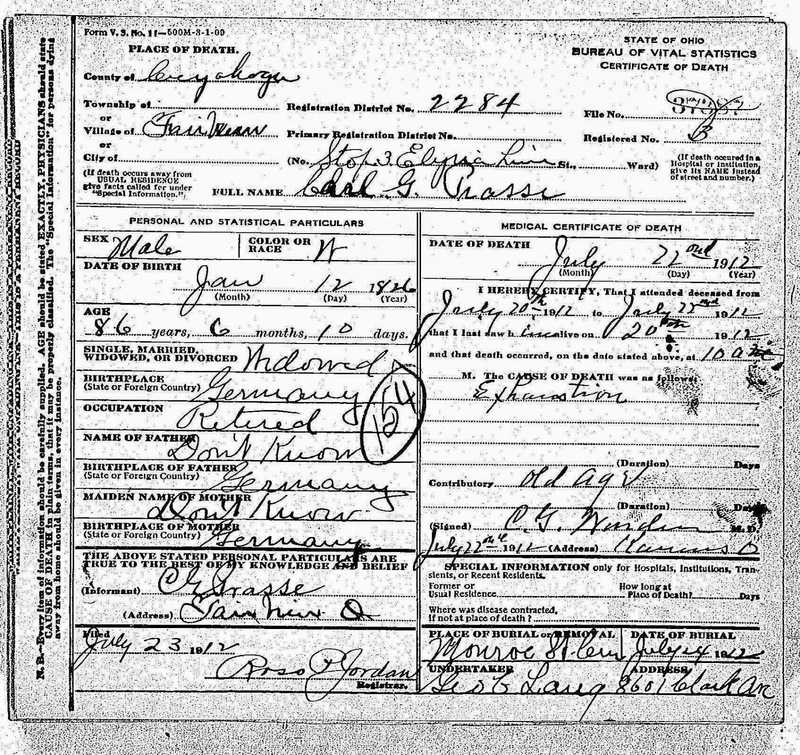 Prasse’s death certificate lists his mother as Anna Sisser born Germany. So we have her given name listed in various records as both Christine and Anna. The 1870 census reveals that the original German name may have been Christiana. It also reveals that Christiana and her husband Carl Gustave Prasse were from Saxony. Some of the family trees on Ancestry.com say Leipzig but I have not seen a source for that yet. "Ohio, Deaths, 1908-1953," index and images, FamilySearch (https://familysearch.org/pal:/MM9.1.1/X6WY-7LX : accessed 16 March 2015), Frederick Emmanuel Prasse, 31 Dec 1935; citing Lakewood, Cuyahoga, Ohio, reference fn 72091; FHL microfilm 2,022,570. There appears to have been a second man named Gustave Prasse that naturalized in 1872. 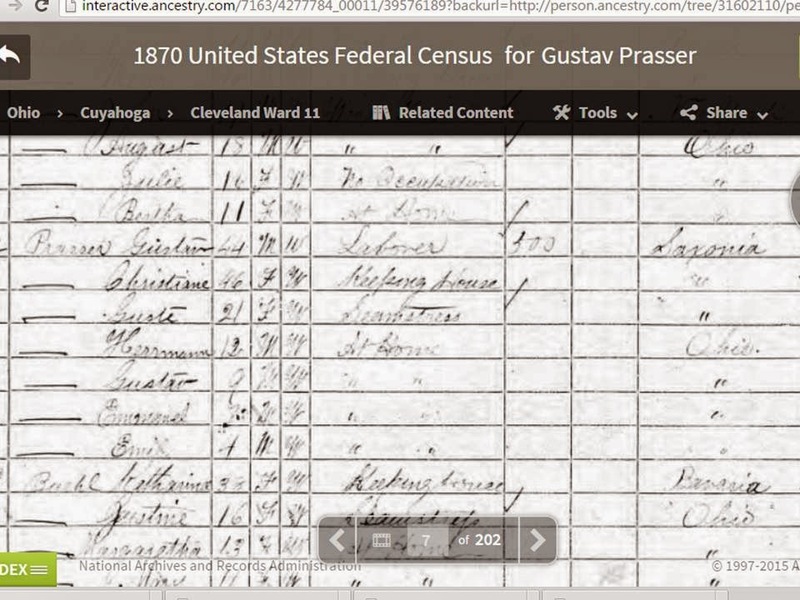 The 1870 census record clearly shows that the Prasse family was from Saxony. 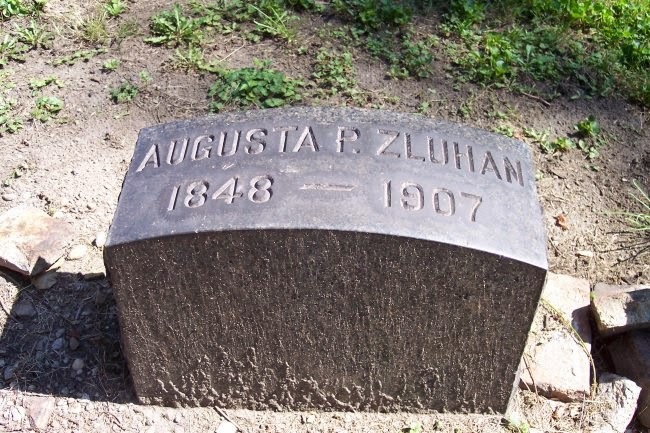 The oldest daughter, Augusta (Guste) was born in Saxony about 1849 per this record and 1848 per the gravestone. The family immigrated before Herman was born in Ohio in 1858. More research is needed to find this family in the 1860 and 1880 census. There is a nine year gap in the ages of Augusta and Herman. This may be explained by the 1900 census where Christina says she she was the mother of nine children and that only four were alive in 1900. Come learn more about how to research your German heritage at the Ethnicity Focused Research Special Interest Group. Beginning in March 2015, The Bay Area Genealogical Society will host a monthly presentation and working session focusing on researching ancestors from a variety of countries. Location: Friendswood Activity Building located at 416 Morningside Drive, Friendswood. Nick Cimino and Bob Wegner, BAGS members, will kick-off this Special Interest Group with a detailed look at German ancestry research. Saturday, March 21 at 1:00 pm: How to identify the hometown of German ancestorsin American records.